There are plenty of things to do in Fort Worth, especially if you’re the handy type. You might be an avid home renovator, a devoted spring cleaner, or even a professional who works in a hands-on field like construction. In any of those cases, you’re almost guaranteed to find yourself involved with situations that produce significant quantities of waste materials. Whenever you produce junk, you’ll have a responsibility to make sure it is properly collected, sorted, and disposed of—preferably in an eco-friendly way. People try all kinds of things to rid themselves of unwanted waste materials, but they often ignore some of the most convenient and cost-effective options. Roll off dumpsters provide some of the best options for homeowners and professionals alike. Renting roll off dumpsters can allow you the kind of flexibility and peace of mind that makes cleaning up the easiest part of your work. Roll off dumpsters are not the only option for cleaning up after a project, but they offer certain distinct advantages over other strategies. Unlike a full-service clean-up crew, a roll off dumpster is available for use at your convenience—after it is dropped off on your property, you’ll be able to fill it at your leisure instead of having to take time from your schedule to supervise and accommodate a group of people. Dumpsters are also a much easier and stress-free option than trying to collect your waste materials and transport them to a landfill or transfer station by yourself, which can damage the inside of your vehicle and cost you significant amounts of time spent sorting the items. not everyone understands just how many situations there are in which you can use a rental dumpster. Fortunately, we at Junk King have put together a list of some of the best uses for a rental roll off dumpster in the Fort Worth area. Have a look at the following situations, and see how many of them seem familiar to you. The next time you find yourself in one of them, consider renting roll off dumpsters as a waste management solution. Spring cleaning is a regular annual undertaking for most residents of Fort Worth, especially those in multi-room homes where junk tends to accumulate out of sight. However, most spring cleaners do not realize the potential that rental roll off dumpsters have to help them simplify the process. The common assumption among many homeowners is that roll off dumpster rental is exclusively for construction or home improvement projects. In fact, these are only two of many areas where dumpster rental can make a difference. Spring cleaning is about much more than merely sweeping behind the fridge and finally dusting the corners of hard-to-reach surfaces. It’s also one of the year’s best opportunities to go through storage rooms, garages, and closets to collect and remove items you haven’t thought about in years. Often, homeowners find much more than old toys and keepsakes tucked away in such spaces. They also come across spare building materials from old or abandoned home improvement projects, collections of old tools, and other items that can be recycled or repurposed. Speaking of repurposing, you can also repurpose entire rooms in your home—if, for example, you want to add a new bedroom to welcome in a future family member. Many married couples are simply repurposing existing rooms in their homes when they become pregnant instead of buying a larger house. It’s a more efficient and economical way to make space for the new baby. However, it can also involve a lot of work to change an existing area into a nursery, and that process is likely to produce a lot of junk along the way. Repurposing a room is about much more than just clearing unwanted items out of it. You’ll also have to replace or modify features like furniture, flooring, and wallpaper, especially if you’re trying to make the space baby friendly. Of course, not all repurposing is done to prepare for a new arrival in the family. Some homeowners want to raise the value of their property by turning existing areas into new bathrooms or other high-value spaces, which can mean even more extensive changes. Roll off dumpsters make ideal places to store surplus drywall, hardwood, bricks, concrete, and other byproducts of this process. Of course, you don’t need to change the nature of a room entirely—sometimes, you just want to update or improve an area of your home while maintaining its original purpose and functions. However, just because you aren’t throwing the baby out with the bathroom (so to speak), that doesn’t mean you won’t still have to do some serious work. Bathroom and kitchen renovations can be extremely involved since these are some of the most valuable rooms in any home. In addition to the walls and floors, you may find yourself replacing old piping, lighting, and working with glass fixtures for windows and skylights. Many of the materials that you’ll be replacing will be suitable for collection and green disposal in a rental roll off dumpster. Projects aren’t always internal. Sometimes they take place outside the home. When they do, they can be even more extensive than work performed indoors, and they often produce even higher amounts of waste material. What many people do not realize is that such materials are often ideally compatible with rental dumpsters. There’s a pervasive idea that rental dumpsters are only for artificial materials, when in fact they can hold numerous natural and organic materials as well. Bagged leaves, tree limbs, grass clippings, and even stones can be collected in dumpsters and removed by a company that will process them appropriately. At Junk King, we have a policy of sorting the contents of every container we rent out so that we can dispose of the materials in ways that are maximally friendly to the environment. Who says that dumpster rental can only be helpful in situations where you must do hard work? They can also be useful ways to collect waste materials from parties and events. If you’re hosting a block party, a neighborhood gathering, or a collaborative project such as a community garden, you can use a dumpster to collect many of the leftover materials. Of course, certain items aren’t appropriate for placement in roll off dumpsters, and you should never place items in someone else’s dumpster without the owner’s permission. Renting your own dumpster for an event you are organizing is perfectly acceptable though, and you can collect many common party materials in them. These include boxes, paper, cardboard, packaging, disposable tablecloths, plastic cups, plates, and balloons. Roll off dumpsters can be used for a wide variety of purposes, but you’ll have the most versatility when you choose your rental company carefully. Look for an organization that puts specific attention on sorting the contents of their containers after picking them up at the end of each rental period. If you do, you’ll be able to fill your dumpster with confidence. You may also wish to choose a company that uses innovative pricing models to provide consumers with advantages. 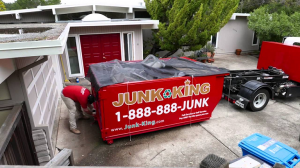 At Junk King, we charge based on the amount of space used in each rental container instead of basing our prices on container size or other more arbitrary factors. Now that you know some of the applications for roll off dumpsters in Fort Worth, you’ll be free to find the rental company that suits you best. Keep the situations listed above firmly in mind, and you’ll always have the information you need for the next time you need to rent a roll off dumpster. Contact us for more information. This entry was posted in Uncategorized and tagged Debris Removal, Dumpster rental, Junk King, Junk King Fort Worth, junk removal on November 28, 2017 by Julian Torres, "JT". Last updated June 24, 2018 .